cheers to a long weekend! planning to have a little hotel staycation here in los angeles and maybe a beach bbq with friends. what are your plans? 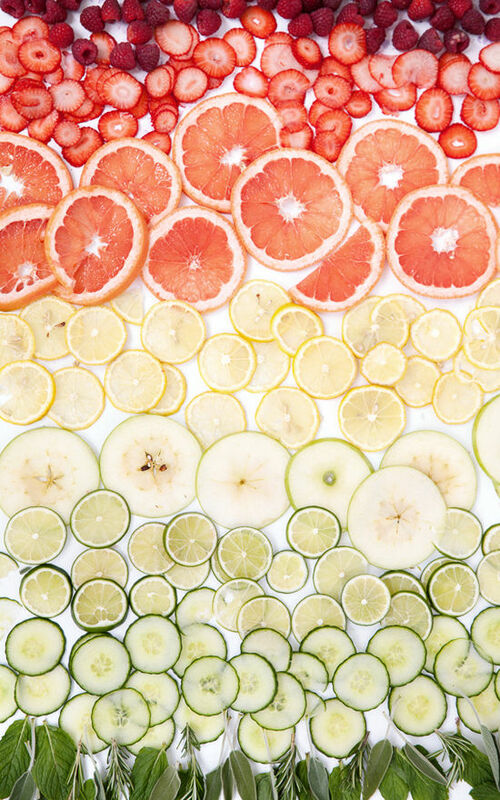 if you’re hosting a party of just hanging out by the pool i recommend trying these colorful fruit ice cubes…. for starters we bought a variety of fruit and herbs. then, we cut the fruit into really thin slices before adding them to the water in the tray. it was fun to play around with the colors and shapes, experimenting with different flavors. 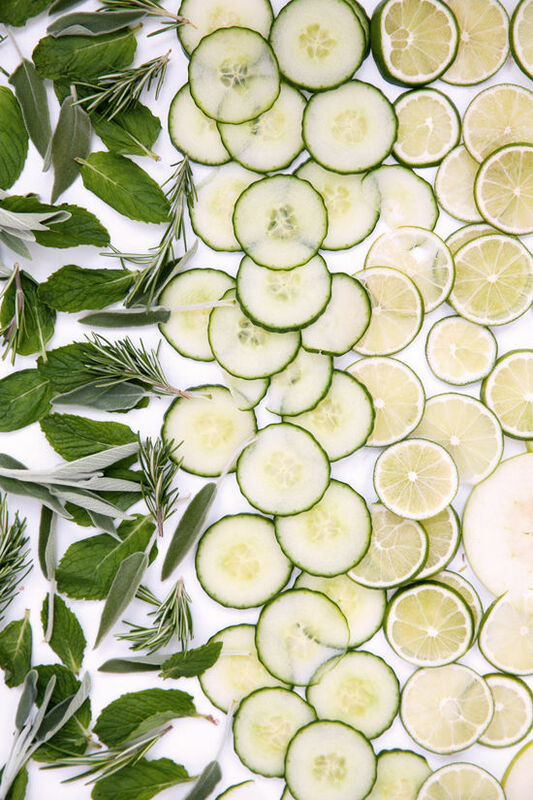 we kept some simple with a small slice of lemon and made bolder combos like mint + cucumber and lemon + sage. 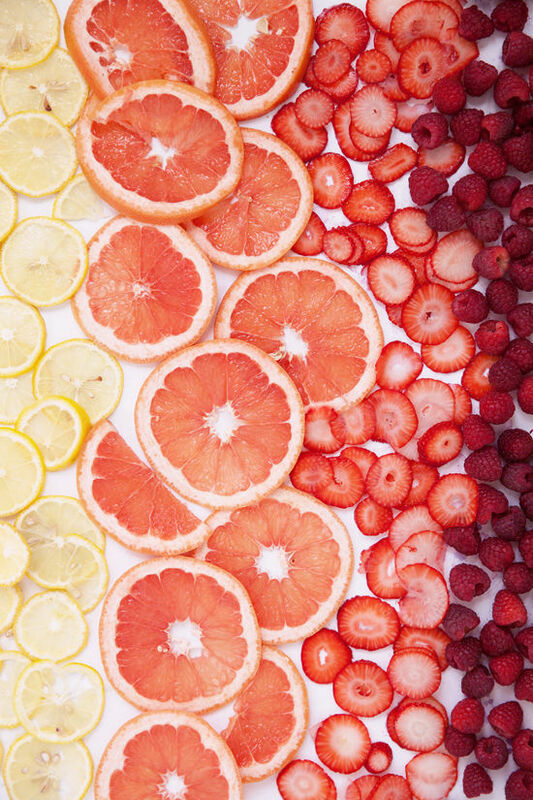 you can add them to a cocktail or to a pitcher of plain water for a punch of color. these pictures are BEYOND gorgeous!!! 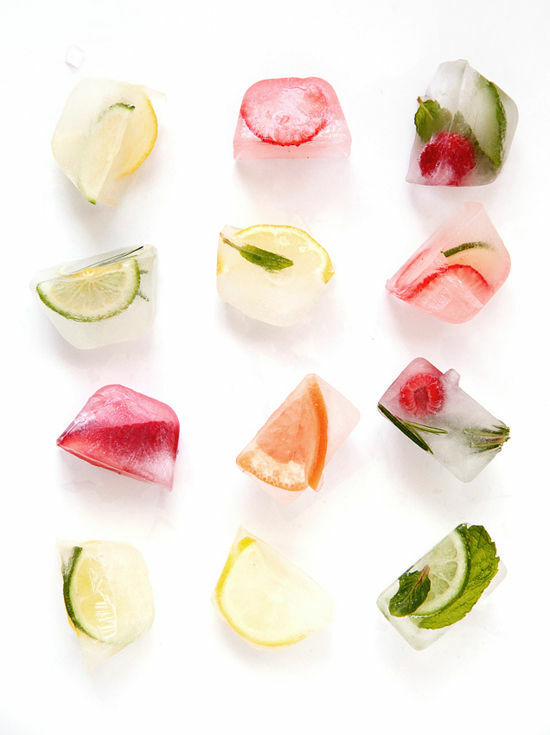 i can’t wait to make some ice cubes of my own, such a clever idea! The pics are just so pretty ladies! Beautiful! Love, love, love it!! Bravo!! those pics are gorgeous! i want to print the top one for my kitchen, anywhere i can buy a print or get a large version of it!?! YUM! I can’t wait to try some of these out! 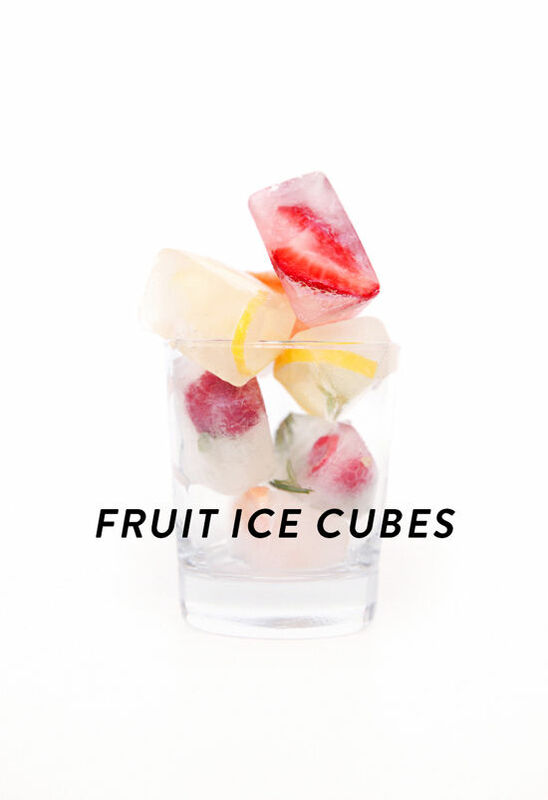 Okay, fruit ice cubes. These are my spirit animal. That is the most beautiful fruit I’ve ever seen! A staycation in a hotel sounds so LOVELY right now. And these photos are gorgeous! love this idea and photos! i would actually love to purchase that first photo to hang in my kitchen…any way of doing so?? thanks!! 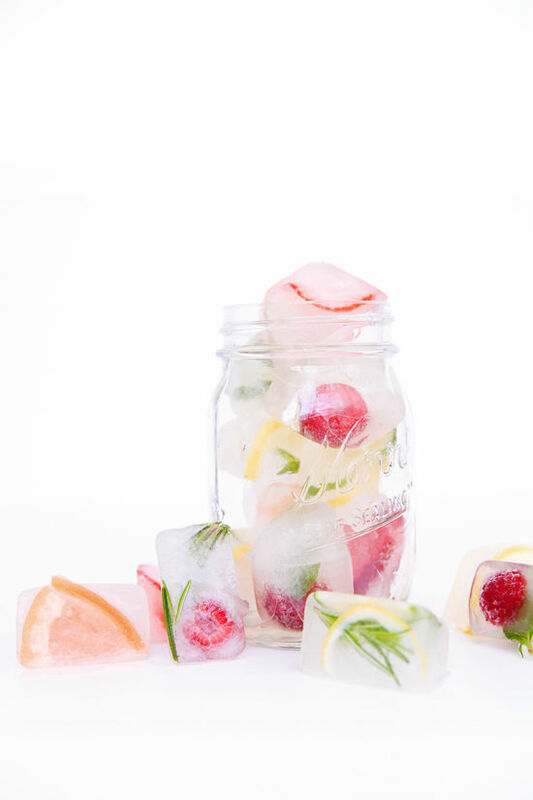 I am totally in love with the pictures 🙂 and also the idea of fresh fruits and herbs ice cubes! Such a great idea! I always “pimp” my water with cucumber or lemon, but I never thought of fruits or even herbs! Such a cool idea, especially as ice cubes : ) I am definitely gonna try it out soon! I’m just in love with the vibrant colors. They almost look too pretty to use. I kinda like the combination of mint and cucumber. Great idea! These just look so pretty! 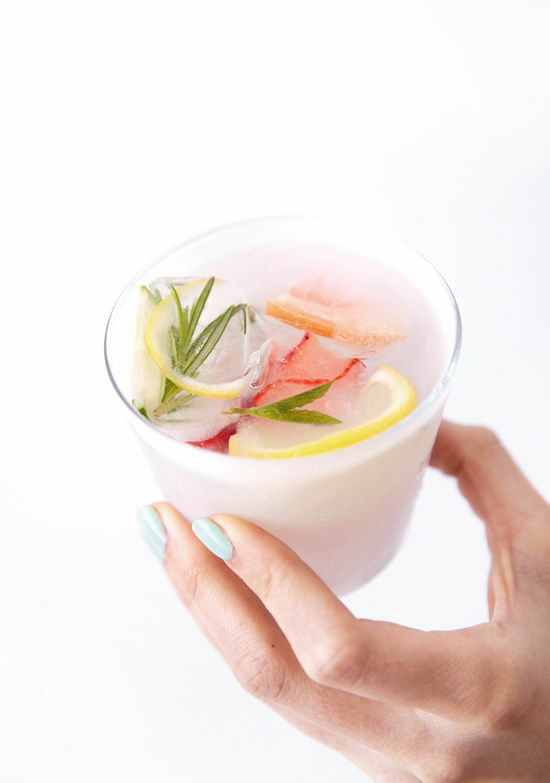 Perfect addition to a yummy cocktail or to refresh your water. Caught my eye! Great party idea! I will try these fruit ice cubes next weekend 🙂 Thanks for sharing. You inspired me! That is such a lovely idea. I wanna make a huge pitcher full of it. the internet. I’m going to highly recommend this blog! I am in fact thankful to the holder of this site who has shared this great post at at this place. I have go through many articles and additionally gone through some,your job is usually amazing.Hats off in your devotion together with credibility.Do retain all of us advised at a later date too. Cool! It is a very creative idea too. These ice cube simply look awesome, everyone will love it.